Holidaymakers planning to venture abroad over the May Day bank holiday weekend have been urged to look out for potential train disruption. Many Britons are likely to use the three-day break as an excuse to venture overseas. But they have been encouraged to plan ahead in case their rail journeys to and from the airport are disrupted by engineering work. For instance, Network Rail has said that no Gatwick Express services will run between the airport and London Victoria over the bank holiday. Fast, direct services will run to and from London Bridge instead. 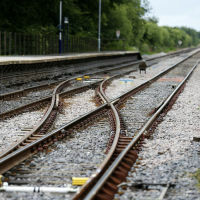 Elsewhere, services run by the likes of V irgin Trains, Great Western Railway and TransPennine Express are likely to be impacted by engineering work over the weekend. However, Network Rail said that it still hopes the period will represent "one of the least disruptive bank holidays for railway travel for many years". People have a range of options open to them when it comes to May holidays, whether it is a city break or a trip to a sun-kissed beach resort. However, trusted travel insurance is something they should think about - along with their journeys to and from the airport. This can protect them against unforeseen events and offer peace of mind to those heading abroad. With £33 million of improvement work due to be carried out over the May Day weekend, buses will replace trains between Glasgow Central and various parts of north-west England from April 30 to May 2. Meanwhile, London Paddington will see reduced services over the weekend because of ongoing Crossrail and electrification work. Mark Carne, chief executive of Network Rail, said: "We're continuing with our huge investment programme and we have a lot of work to do this weekend, but we've planned it as far as possible to minimise disruption." He added: "Over 11,000 members of the railway's orange army will be out working this bank holiday to build a bigger, better railway as part of our £40 billion railway upgrade plan all aimed at providing better, more reliable journeys for passengers and businesses across Britain."